LET 18-year-olds vote - that notion will be the focus of a public forum organised by the Worker's Party (WP) youth wing this Saturday. The question may not traditionally have been a major political point, but WP youth wing organising secretary Bernard Chen, 22, said that the topic was chosen because it is one that is 'close to his heart'. 'If youth had a chance to vote at a younger age, I think the likelihood is greater that they will get involved and interested in government and politics,' he said. He disagreed with the notion that the young may not be serious enough for such a responsibility. Currently, the official voting age is 21. The forum will be the first in a series that the opposition party has named YouthQuake, meant as a platform for raising youth-centric issues. I'm sure most of us are aware of the 'slapping' incident of the SQ Stewardess onboard an SIA flight to Tokyo last September. So after being accused and slapped by tycoon's wife, Tan Siew Hoon, the SQ Stewardess was said to have suffered from 'emotional and mental distress'. Hence she filed charges against Mdm Tan. On 24th April, Mdm Tan was acquitted and let off with just a warning. Read report here. Seriously I felt that the Stewardess did the right thing by charging Mdm Tan for 'abusing' her at work. In fact, no one should allow oneself to be treated unfairly or unjustly, this is human rights! Therefore, when I knew about the charge I was of course rooting for Stewardess, Then Jiamin. But Mdm Tan was acquitted with only a warning instead of being locked up for a year or fine S$1000, or both. According to the report, the case had been settled with out-of-court settlement which was of course MONEY!!!!!!!!!!!! As mentioned, SIA is an iconic symbol of Singapore, therefore they should not just let MONEY solve the issue!!!! Then what kind of signal is SIA sending here? A company that can endure insult and humiliation as long as the amount is right? Ridiculous! Was your last increment at least a 6.7% to counter this? SINGAPORE: Singapore's consumer price index (CPI) in March went up by 6.7 percent from a year ago. The Department of Statistics said the rise was due largely to higher costs of food, transport and communication, and housing. The CPI for the first quarter of this year was 6.6 percent higher compared with the same quarter of previous year. On a seasonally adjusted basis, the CPI in March was 0.3% higher compared with February. Singapore's inflation rate has been hovering at its highest level in 26 years. Earlier this month, Trade and Industry Minister Lim Hng Kiang said the inflation rate is expected to go down in the second half of this year. The government's forecast for inflation this year ranges between 4.5 percent and 5.5 percent. SINGAPORE : The National Environment Agency (NEA) is launching a campaign to get households to reduce the amount of electricity used. It says households use 78 percent more electricity now, compared to 12 years ago. The 'Energy Challenge Campaign', which will be launched at Suntec City on April 26, targets 1.12 million households. Following the recent saga of whether DPM Wong should resign and the question that was left unanswered by LowTK...I salute and thank matured Singaporeans. Back in 2006 when I joined the WP, I chose them because I was confident then that the party's leadership would do its utmost to not act immaturely and rashly. In other words, I felt safe joining them. Some people say WP is too conservative, too quiet, too shy-media. Take the recent saga at Parliament for instance. LowTK together with a few others MPs in the Parliament raised the question on whether DPM should resign. It was a collective of thoughts from the ground that LowTK had expressed in the house. We wanted someone to ask the PM questions on our behalf wasn't it? On top of that, LowTK brought up one important reminder to not only us but the PM as well. The issue on the million dollar pay check. Having been paid the highest in the world, should the level of responsibility and accountability be higher as well? Given circumstances as such, can the PM and his Ministers get an increment the 3rd time? Or rather would they have the face to do so? The way PM had shielded DPM seemed to oppose the thought of a credible pool of elites with high level of integrity. And of course, our PM had always been good at side-stepping questions isn't? Besides spending 3 months to come up with a ridiculous report what else had the PM did? It was a report that anyone can take a week to produce. Why 3 months? Where was he when the issue first came to light? To me it was a case of negligence! Windows without grilles was known but problem not rectify. Fencing were mounted too closely to the window which Mas Selamat had taken advantage of. Guards and officers does not even qualify the basic qualities of due diligence that is to kicked open the bloody door when things became suspicious. Plentiful supply of toilet paper for Mas Selamat to act as cushion...wahhhhhhh this one really cannot take it!!!! CCTV that were not working where everywhere else in Singapore is having CCTV that can operate even in restaurants as a matter of fact! And lastly...whoever approved of the design of the detention is the biggest fool! The place was design as though it was a hostel! Not detention centre!!!! I'm sure all of you out there can do a better job. And the mere thought of our Government still harbouring the thought of finding Mas Selamat in Singapore had already been ridiculed by other countries. Seriously, I'm still not very convinced that Mas Selamat escaped the detention centre because till today we don't see visual evidence of his escape. On the whole, I dont think that it was an honest mistake made...it was a case of negligence due to complacency. Be ready to rock and shake with the WORKERS' PARTY YOUTH WING!!!! Remember this 'Look out' Notice? The Workers’ Party Youth Wing is pleased to invite you to participate in the first of our YouthQuake Forums and partake in a discussion on how youths in Singapore can be encouraged to adopt and carry forward a refreshing new agenda on voting age. This forum session seeks to educate, empower, and unite young people to bring youth-centric issues into the forefront of public discourse. It aims to provide an opportunity for youths to share their insights and opinions on promoting a vote@18 agenda in Singapore. Time: 1400 hrs – 1600 hrs. WE LOOK FORWARD TO SEEING YOU THERE!!!!!!!!!!!!!!!! 3 critical factors...what a joke! SINGAPORE: A confluence of three critical factors led to security lapses that resulted in Jemaah Islamiyah (JI) detainee Mas Selamat Kastari's escape from detention in February. This was the conclusion of the Committee of Inquiry (COI) on Mas Selamat's escape from the Whitley Road Detention Centre on 27 February this year. The findings of the three-member panel were presented by Deputy Prime Minister and Home Affairs Minister Wong Kan Seng in Parliament on Monday afternoon in a Ministerial Statement. First, there was a physical security breach as the ventilation window in the toilet –from which Mas Selamat made his escape – did not have grilles. A toilet window with no grilles does not means that its easy for detainees to escape...Mas Selamat is a man who is stoutly built not skinny. He would have struggled and squeezed his way through with much difficulty. Second, the guards watching Mas Selamat allowed him to close the door of the urinal cubicle when they should not have done so. Then why did they do it? Err...although I'm not a man...but I know that urinals have got no doors...am I not right? And third, there was a physical weakness in the perimeter fencing outside the Family Visitation Block, where the toilet was located, which made it easier for Mas Selamat to get out of the detention centre's premises. Didn't Singaporeans pay enough taxes to have proper fencing? Or can we have pay cut for Ministers' so that we can afford better fencing? On the day of his escape, Mas Selamat was escorted by two Gurkha guards and a Special Duty Operative - who is an Internal Security Department (ISD) officer - from his cell to a locker room to change into civilian clothes for his family's visit. Gurkhas officers; I thought they were Foreign talent? How come can make mistakes? At the locker room, the guards lost sight of him when he stood behind a column of lockers to change. He was then escorted to the Family Visitation Block, where he used a toilet, renovated in 2007, to shave and comb his hair before meeting his family members. He then entered a urinal cubicle, closed the door and turned on a water tap inside the cubicle. One guard stood outside the cubicle door, while the other was outside the main toilet door. After a while, the guard outside the cubicle felt Mas Selamat was taking too long. But instead of checking, he alerted the second guard outside the toilet, who alerted the female Duty Operative. The Duty Operative then alerted a male Assistant Case Officer, who ran in, kicked open the door and found Mas Selamat gone. The ventilation window in the cubicle was left open. See, this is exactly what we mean by working in the Governement sector. Everything one needs to report before action can be taken. So they reported instead of taking action at that point of time. How ridiculous! Remember the Singapore made movie 'Just Follow Law'? How true! Mr Wong said the delay by the guards and their failure to keep Mas Selamat in sight was the second most critical security failure which led to the terrorist's escape. By this time, 11 minutes had lapsed since he first entered the toilet. The COI found that during renovations in 2007, grilles had not been fixed to that particular toilet window due to a misunderstanding between the ISD and the contractor. The superintendent of the centre, who was alerted to this weakness in May 2007, asked the contractor to saw off the window handle as a security measure instead, which Mr Wong said was a bad judgement on the superintendent's part. In addition, the CCTV coverage of the area was being upgraded to add motion-detectors, but the cameras were not yet operational. The CCTV were not yet operational??? Or was there something that cannot be shown so it will not be shown? What a perfect time for CCTV to be unoperational! While there is no conclusive evidence as to how he had escaped from the centre after that, the COI believes Mas Selamat may have climbed onto the roof of an enclosed staircase which converges with the perimeter fencing. He could then have jumped over the fencing out of the centre. No concrete evidence and they 'believe'...is this the kind of answer COI can give after near to 3 months of investigations? The COI also believes that the JI leader had planned his escape over time. DPM Wong said: "Prior to his escape, during previous family visits, Mas Selamat had partially closed the urinal cubicle door on some occasions. " On 5 February 2008, he had closed the urinal cubicle door completely and turned on the water tap. The COI believes that these actions by Mas Selamat could have been done to test how the guards would react. This could also have helped him prepare for his actual escape attempt. "This planning had not been noted by the guards, possibly because the guards are frequently rotated to avoid over familiarisation or fraternisation with detainees." The COI – comprising Mr Goh Joon Seng, a retired High Court Judge; Mr Tee Tua Ba, a retired Commissioner of Police; and Dr Choong May Ling, Deputy Secretary of Security at the Home Affairs Ministry – was given full access to all information in its investigations of Mas Selamat's escape. This included highly classified and sensitive information on operational systems and processes, as well as access to interviews with ISD intelligence and field personnel. The committee submitted its report on 10 April and Mr Wong said he is "satisfied" that it has "held nothing back" in its conclusions and recommendations. Mr Wong, you are satisfied...but are Singaporeans satisfied? He added that in view of the keen and valid interest of MPs and the public, an Executive Summary has been released on the COI's findings. In response to a question from opposition non-constituency MP Sylvia Lim, Mr Wong said Prime Minister Lee Hsien Loong is expected to make a ministerial statement in Parliament on Tuesday on government responsibility for Mas Selamat's escape. WHO IS RESPONSIBLE? SOMEONE HAS TO BEAR IT! STOP SHELVING IT AWAY! And interestingly there is no visual evidence to proof that Mas Selamat indeed escape....so question...did he really escape? Singapore, because of her size, the small little red dot on the map, it’s indeed a very niche market area for many businessmen. No doubt, this small little red dot had progressed and advanced superbly. Many businesses had been set up and of course folded up too. Our government is always encouraging people to go into entrepreneurship. Many incentives had been promised to help these entrepreneurs and SMEs. However, being an entrepreneur in Singapore is definitely an uphill task. In my view, two major factors that are holding people back from entering into a business in Singapore, is none other than rental and labor cost. As if that is not enough, they had an opponent that is hard to beat if you are competing on prices which is what most consumers are comparing. I am sure that most small to medium business owners agree with me that this competitor is none other than ‘Auntie Lucy’ if they happen to be in the same industry as them. They seem to be in every industry, venturing into anything that is profitable. ‘Auntie Lucy’ first started off as a union, to protect and safe-guard the well being of employees. Over the years, they had expanded and now we have ‘Auntie Lucy’ doing nearly everything. Dental, Healthcare, Supermarket, Child Care, Food Court, Convenience shop, Car Rental, Insurance and even home services such as part-time maids, plumbing services, etc are businesses that ‘Auntie Lucy’ is currently engaged in. Apart from protecting the welfare of employees, they had now threatened the interest of the self-employed which will indirectly affect the employed. Yes, ‘Auntie Lucy’ aims to provide consumers with wider choice and value for money services which is a good sign provided the pricing is not below market standard and it enables the rest to remain in the race. By the way, are they really providing a better price? Recently they had absorbed GST and yet make big profits. Understood from a friend whose father is working in a particular brand of a bread. She said that according to her father, on the surface ‘Auntie Lucy’ is absorbing the GST but in actual fact the suppliers were the ones that were forced to absorb it. Let’s take part-time maid as an example. This is a job done mostly by housewives. They will go to their customer’s place, do the chores and are paid hourly. Housewives that need to take care of their young children or needs to take care of elderly parents are not able to work outside; therefore this is an ideal income-generating means for them. However, this means had been made saturated by competitors like ‘Auntie Lucy’. I would like to talk about the Financial Industry as well. It’s definitely booming, year in year out, LIA (Life Insurance Association) had announced two-digit growth in the life insurance industry. Agents tied insurers accounted for 71% of new businesses, banks contributed to 17% and the rest was distributed by the Independent Financial Advisers. Out of these 3 channels, ‘Auntie Lucy Income’ can be found in 2 of them; agents tied insurers and Independent Financial advisers. Besides Life Insurance, ‘Auntie Lucy Income’ also participates actively in General Insurance businesses. Most of the time, quoting premiums which are unbelievably low, causing other insurers to follow suit or give up the deal so as not to incur losses. Insured are always complaining about the poor customer service they are having especially when it comes to a claim. Recently, ‘Auntie Lucy Income’ announced that they are going to compete for the Number one position in the Insurance industry. They are going to expand their sales force by recruiting more Advisers. If they should succeed in growing their sales force, very soon they will monopolize the market. Even if other insurers were to have better policies they may still lost out because most Singaporeans will go for something that is cheaper. Take for example: How many people actually read the terms and conditions carefully when purchasing a travel policy? Most of us would just purchase the one that is cheaper. Just when I thought that ‘Auntie Lucy’ is the only competitor when it comes to pricing I was shock to find out from friends who work in the laundry industry that, their main competitor is …. This friend of mine had been working in a commercial laundry as a Marketing Manager for years. For the past 5-6 years he realized a massive drop in sales volume. Previously, commercial laundries take their fair share of the market. Different hotel chains will be handled by different laundries, the same for hospitals and restaurants. I can understand his frustration. This competitor can afford to quote that low simply because their labor cost is very low, near to zero. Laundry is done in the premises of the prison, therefore what rental cost are we talking about here? Of course, they are the statutory board whereas the commercial laundries are paying their employees, rental expenses, finance loans, etc. When one project is lost, the company had to start to under-cut to get other projects which probably initially were not done by them. Thus creating disharmony and relationship became strained. I always hear people saying this, the government is going into any business that is making money, and I wonder when are they going to do the casket business? I often laugh when I hear things like that, but one day we could be seeing ‘Auntie Lucy’ selling casket. Guess what? Out of curiosity, while writing this post I browsed through the net for ‘fair price casket’ and it appear, top of the list! I wonder if it is associated or it’s just a somewhat similar name. Due to this find, I went around to some friends to ask. Most of them told me that, yes, this is under ‘Auntie Lucy’ while others said not sure. In conclusion, the fittest may not be able to survive in this race, the richest and largest will. The sun was shining brightly and the day was set beautifully for a walk. This was no ordinary walk that the WPYW Women attempted on. 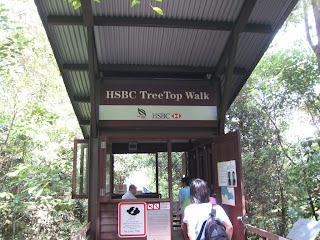 It is the ‘HSBC Tree TopWalk’ at MacRitchie Reservoir. 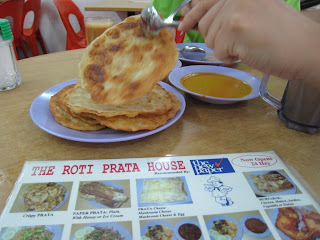 Our ladies reached Upper Thomson Road for some mouth-watering prata before we made our way to the Tree-Top walk which is accessible from MacRitchie Reservoir Park or from Venus Drive, off Upper Thomson Road. The one that we attempted on was the trial that is highlighted in yellow. In other words that is the longest trail, to be exact its 15km (to and fro). All of us were equipped with water and insect repellant as well as cameras. At approximately 10am, we were ready to embark on the journey up to the tree-top. 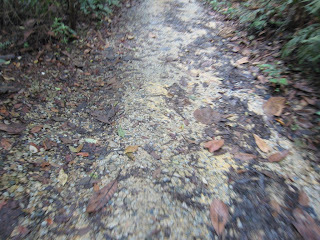 The roads were paved with rocks, bricks, sand and dried leaves. It was a pretty rough walk, at times we encountered strange looking insects crossing our paths. 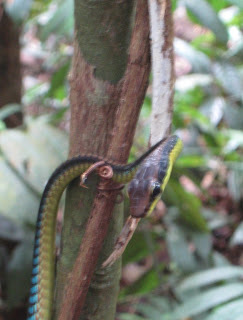 Insects that were as big as one’s little finger! 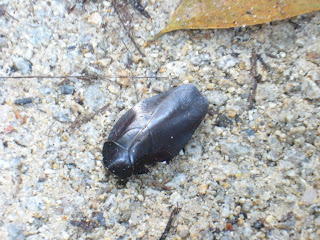 The ants were extremely huge too; they must have had good nutrients from the nature reserve. Walks like that creates good opportunity to know about each other and at the same time discuss problems. Once in a while we will stop to take pictures and when that was done something else would be watching us from about 2 metres away. Haha! That something else happens to be the monkeys! These human-like animals will look at us with curiosity and when we approach for a closer shot of it, it will swing its way off into the densely forested place. After walking for about 2 hours we finally reached the peak which is the tree-top. 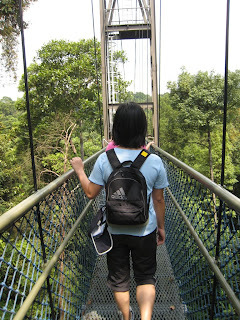 The walkway is a free-standing suspension bridge spanning Bukit Peirce and Bukit Kalang, the two highest points in MacRitchie. 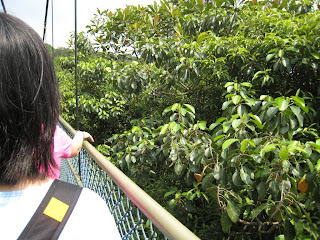 At 25m above the ground, the walkway gives you a closer look at the canopy. 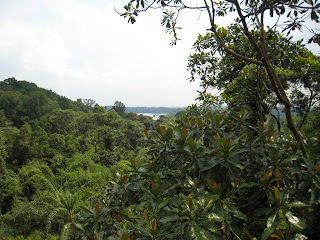 Here, we can view trees from an entirely different angle and enjoy a panoramic view of Upper Peirce Reservoir. What a spectacular sight! This walkway is narrow and the number of people that can be on the walkway at the same time is 30. When we were on our way down, we were caught in the rain and had to seek shelter in one of the pavilion in the golf course. 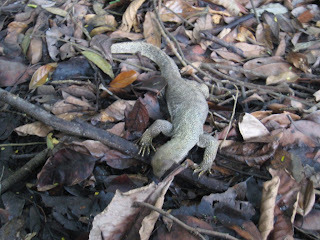 While making our way there we saw an Iguana that was about 70cm in length, as if sensing that I was running towards it to take a picture, the quick-witted animal ran too and at a much faster pace then I was! We also spotted two playful squirrels having fun in the rain at the golf course. After about nearly an hour, the sky is still cloudy and the rain is not stopping. We decided to carry on with our journey despite the drizzle. 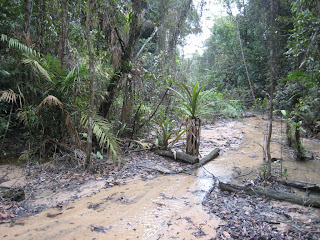 The journey back is much tougher than the one going up because the roads were now slippery and wet. With all obstacles coming our way, our ladies fought on and we were highly motivated to end our walk in the fastest possible time. In about 4 hours, we ended our journey of 15km and we could not wait to rush off to our well-deserved lunch! Something exciting is coming and it will kick-off in May. Look out for the 'Youth ...........' !!!!!!!!!! This post is in response to quite a collective number of feedback both on my blog as well as from my acquaintances. The question is, how many candidates can WP fill in the next election? The feedback some gave was, fill more candidates, this will increase the probability of having more seats in the parliament. Thank you for the feedback :) and am glad to know that people are more open to the idea of having opposition in parliament now. The answer to these questions and feedback lies on 1 factor; how many members can we have by the next election? Yes, manpower is what we need. We cannot be having all members that have calibre to run as candidates. If everyone is to stand as candidate, who is going to be in charge of the support work? - Queuing up at Cantonment Police Station for a rally venue. - Liasing with contractors on building tentages, stages, lightings for the rally to take place. - Making sure that we have enough people to run errands such as obtaining forms from the Election Dept, filling it up and handing it in. - Manpower to walk the grounds together with the candidates when they do house to house visits. - People to go around the contested areas to put up election posters. - People to do research on rally topics, what to say what not to say. Every candidate will need to have an Election agent. Every SMC requires 1 election agent. GRC (depending on the no. of people) 5 election agents. On top of that, every election centre need at least 2 - 4 Polling agents. Counting agents are also required in counting centres. In other words, what we really really need is manpower. 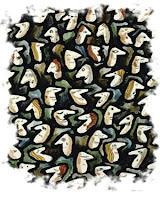 Without sufficient manpower, how can we fill in more candidates? If everyone becomes a candidate who will be doing all these? Candidates cannot be doing support work and running for election at the same time. To me, every win that the opposition had achieved is a 101% win for me. Apart from the candidates, there are many unsung heros to thank for. These are the people that made it happen. These are the people that put in their effort, sweat, strength, time, ideas, etc to make it happen. Without these people, its impossible to field any candidates let alone winning more seats. Hence what we need most is people. People who are passionate and serious about making changes and wanting to see changes. If you who happens to be reading this, like me, want to see changes and you think that WP is the party that you want to work together with, come down to our 'Open House' or contact anyone from the contact list here to find out more. How did he escaped? ANSWERS PLEASE!!!!!!!!!!!!!! 'He said Singaporeans are being complacent when they believe that the Government will take care of all security matters. Hahahahaha! What a joke! Why can't WE BELIEVE? After paying our 'Capable' Ministers so much so as to have the cream of the crop to run the country, why can't we be having the best of the best security? Is it too much to ask for? If you are paid to ensure safety, you jolly well ensure safety! Besides that, you are paid MILLION OF DOLLARS...we are talking about S$ here not Rupiah or RM! Why not pay me? Despite paying them MILLION OF DOLLARS...things still go wrong...apart from Mas Selamat's escape...CPF thingy went wrong. The government thought that CPF can deal with outliving one's resources, they were wrong, otherwise there would not be 'CPF Life'. The government thought that ERP can prevent jam, install it and yet problem is still not solve. The government thought that by sending SM Goh to Potong Pasir and Hougang, PAP can win the 2 wards, they were wrong again. The government thought that by having baby bonus, there will be more babies. Again there were wrong. If a CEO of a company whom is getting a MILLION DOLLAR pay check makes mistakes after mistakes, I wonder if he/ she will get a 'walking letter' from the company. Of course, they were to be blamed...if not who? You and me? Ridiculous! We were not even the one who were looking after the detention centre! Did you and me let him out? Was it you or me who designed the centre? Was it you or me who was looking at the CCTV? But MM Lee disagreed that the Government deserved to be blamed. He said: 'Complacency sets in when a people have not suffered any shock or setback for a long time. 'Hence, his warnings against complacency over the years, 'because most people believe that bad things will happen to others, not to themselves'. Ok Singaporeans! MM Lee had given us the green light! VOTE FOR THE OPPOSITION! BECAUSE COMPLACENCY SETS IN WHEN PEOPLE HAVE NOT SUFFERED ANY SHOCK. LET'S SHOCK THEM LIKE WHAT THE MALAYSIANS DID! SO that we can ensure that our Government will not be complacent.